Lasers-at-Work Consulting Limited specializes in developing laser applications for industry, and promoting laser safety in the workplace. Whether you are considering a new laser process, improving an existing laser application, or have a question about laser safety, Lasers-at-Work Consulting has the experience and expertise to provide you with the solution you need. 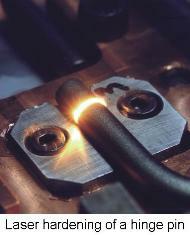 Lasers-at-Work serves industries throughout North America from our base near Toronto, Canada. Please contact us to see how Laser-at-Work can help you. Industrial laser processes, like this laser cutting cell, are fast and flexible; ideal for high volume production, or custom work. This page has been visited 3577 times.